Any fly fisherman knows that fly fishing requires a certain amount of practice and finesse. Having a quality fly fishing reel can become the determining factor between landing and losing that once in a lifetime fish. While the primary function of these reels may be to simply hold the fishing line, they also need to have the durability and strength to maintain that hold. The right reel can also help you become a better fly caster. Shielded bearings to prevent salt intrusion. To help you determine which reels are the best choices for you, this review has compiled a list of the top-rated fly fishing reels. These reels have been highlighted for their high performance out on the water, making them some of the best fly fishing reels to consider using this season. New for 2018 the Gen 2 has been completely redesigned. It has a new 9 window frame that reduces weight. It comes in at 8.4 oz. in a 7-8 line weight rating. It's a large mid arbor reel that's 1.125 inches wide and 4 inches in diameter. It comes in 6 colors. You can switch this reel from right to left hand retrieve. Perfect for beginners and seasoned fly fishermen alike, the Maxcatch BLC Fly Reel is one of the most effective and straightforward fly fishing reels to use. The reel comes pre-loaded with backing and fishing line, making for a quick transition from purchase to use. This particular reel can easily accommodate line weights of 5-6 or 7-8, making it a perfect choice for those looking to chase after trout. The large arbor promotes rapid line retrieval, increasing efficiency and speed while out on the water. As an additional benefit, the rugged disc drag allows for increased pressure during retrieval without harming the inner components of the reel. Reviews rave over the enhanced value of this fly fishing reel, praising its smooth drag. While most fly fishing reels come programmed for right or left-hand use, the Piscifun Sword Fly Fishing reel can easily be converted between the two, making it one of the most versatile reels available. The drag system come with a one-way clutch bearing to ensure smooth and rapid engagement and allows for fine-tuned adjustment. Keeping to a mid-arbor reel size means that this reel sits perfectly in-between standard and large fly fishing reels, improving its versatility for widespread use. The aluminum body is cold-forged and tempered to produce superior rigidity and strength. With the addition of a 3-year warranty, the Piscifun Sword comes with high standards of durability to ensure long-lasting use. Long recognized for providing top-quality fishing products at affordable prices, the KastKing Katmai model is indeed accumulating positive reviews left and right. The sealed center drag unit allows for ultimate protection against sand and water, making this fly fishing reel suitable for saltwater or freshwater use. 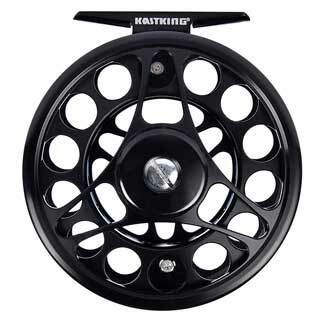 Fly fishermen never have to worry about contaminants getting inside and compromising the drag system, increasing the value of this KastKing reel. The reel itself is composed of a resilient mixture of stainless steel and cold forged aluminum, increasing durability and overall life of the reel. With four available sizes, fly fishermen can easily find the appropriate reel to accommodate 3-4, 5-6, 7-8, and 9-10 fishing lines. Piscifun has long been applauded for producing quality reels at reasonable prices, and the Piscifun Blaze model is certainly no exception. The unique concave arbor design helps increase strength and overall line capacity, as well as decrease the overall weight of the reel. As an additional design benefit, fly fishermen who use this reel experience greater precision for short-distance casts. 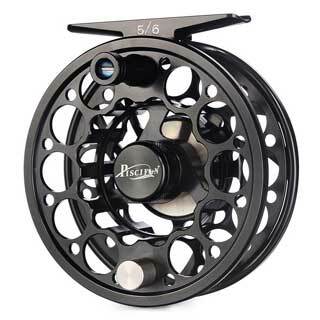 With professional grade fit, finish, and ultra-smooth operation, the Piscifun Blaze Mid Arbor reel regularly outperforms the competing fly fishing reels, at a quarter of the price. The included 3-year warranty increases its overall value, making the Piscifun one of the best and most top-rated fly fishing reels available. There are three general arbor reel sizes: standard, medium, and large. 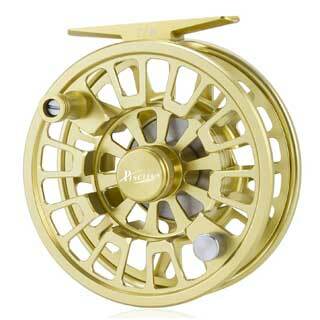 Between these three, most fly fishing reels tend to variate between standard and large reel sizes. Depending upon your needs, the size of a fly fishing arbor reel can have a huge impact on your personal fly fishing needs. A standard arbor reel is a traditional model, coming in at about half the size of the large arbor reel. Due to its size, it may not be able to pick up line quite as quickly in comparison. However, the benefit to a standard arbor reel is that it will be much lighter in weight, ultimately decreasing the possibility of joint or muscle fatigue. A large arbor reel can bring the line in up to 2x as fast as a standard arbor reel, making it a popular choice for fly fishing reels. The sacrifice for speed, however, is that they are typically much bulkier, adding to the overall weight of the reel and the rod. A medium-sized reel is commonly seen as a safer bet for fly fishermen, but is less commonly found when compared to standard and large models. Regardless, size will play a major factor in the overall performance and value of the reel, and you'll want to keep that in mind when looking for fly fishing reels. The drag system for fly fishing reels is an important feature, and the type and strength of the drag system can vary significantly. When considering the right drag system for you, it may be helpful to determine exactly what sort of fly fishing you will be doing, and even what species of fish you are after. Drag systems with little strength may not hold up very well to fast running fish, meaning that you will want to put your focus on a durable, hardy drag system if you are after a quick fish like a saltwater bonefish. Conversely, if your species of choice is a little less focused on speed and agility, like trout, an enhanced drag system may not be necessary. When choosing fly fishing reels, you'll want to keep these two things in mind. The backing is of particular importance when fly fishing, as this determines the ability of the reel to maintain the line while fish are running away. Making sure that the reel can hold the right amount of backing helps ensure maximum efficiency. 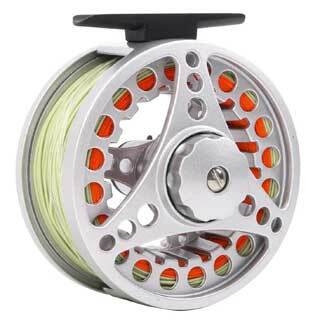 Depending upon the rod you are using, the reel will come with varying abilities to carry fly line weight. Choosing a reel that cannot accommodate your preferred fishing line weight will cause lots of frustration. Avoiding this discrepancy means paying attention to the accepted line weight for each and every reel. No matter where you plan on taking your reel, the important thing is to find the best model to match your own preferences. This includes taking a close look at the best, most top-rated reels to see what elements of fly fishing reels are the most efficient, and which brands deliver the most value. By closely examining what fly fishing reels have been gathering the most praise, you will be well-equipped to find the perfect reel for you. The Basics Of How To Set Up A Spinning Reel, and More!